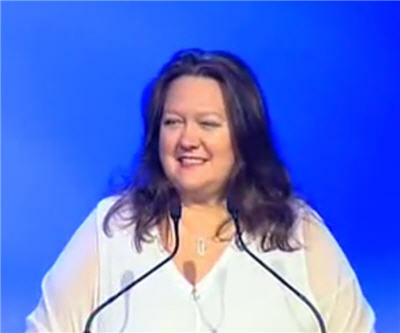 Gina Rinehart increased the wealth gap with her fellow Australian billionaires growing her iron ore and coal empire by $700 million last year according to Forbes' latest rich list . Rinehart's bank account grew 4% to $17.7 billion (20.3 billion Australian dollars) last year, making her a cool $10 billion richer than her nearest rivals, the Pratt dynasty. At number four, South African-born Glencore CEO Ivan Glasenberg, who's also an Australian citizen and steers his commodity trading giant from Switzerland, saw his cash stack up to $6.3 billion. Iron giant Fortescue Metals founder Andrew Forrest at $5 billion rounded out the top five. The fall in the Australian dollar the past year flatter the country's billionaires, which saw their net worth jump higher in the local currency even as their greenback fortunes shrunk. Again Rinehart was the exception and in US dollar terms she's a bit better off than in 2012.